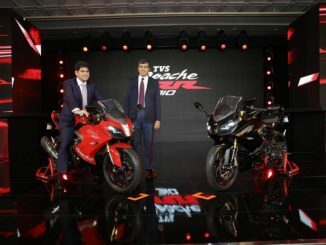 Hosur, September 5, 2017: TVS Motor Company, India’s leading two and three-wheeler manufacturer today announced the launch of a new dual tone styled TVS StaR City+ for the festive season. 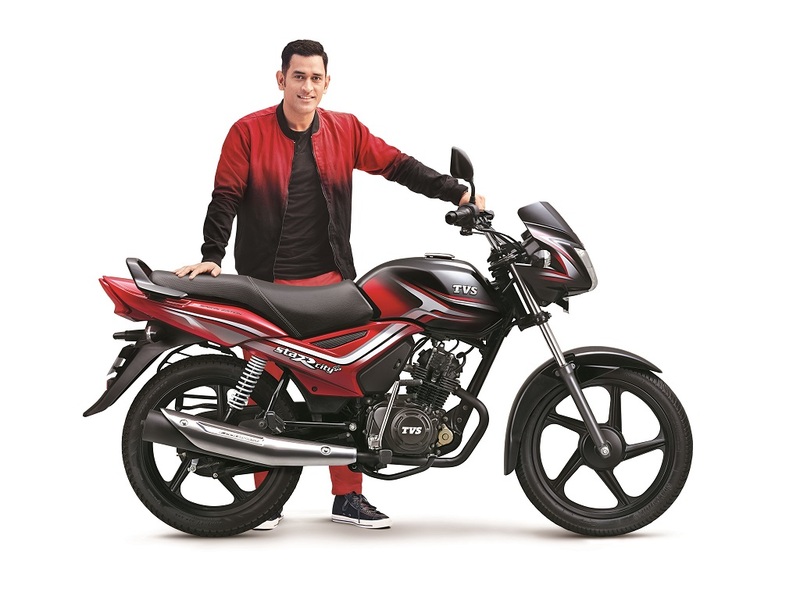 The 110cc motorcycle, which has been a popular stylish performer in its segment, now boasts of new design cues, a striking TVS chrome 3D label along with a stylish black grab rail. The StaR City+ comes with four-speed gearbox “Ecothrust” engine which delivers a solid four stroke performance, churning out 8.4 PS of power at 7,000 rpm with a torque of 8.7 Nm at 5,000 rpm. The ‘Ecothrust’ engine also makes it one of the smoothest performers in its category. With an impressive fuel economy of 86 kmpl*, the highest among its peers, the TVS StaR City+ has been at the top of the game. Equipped with Automatic Headlight On (AHO) and best-in-class features, TVS StaR City+ retains its essence with elegant honeycomb textured side panel grills give finesse to the styling of the motorcycle. Adding flamboyance to the motorcycle are the stylish crown visor and trendy rear view mirrors. A premium stainless-steel muffler complements the bike’s silver shock absorbers and its sporty aluminum black grab rail. Black alloy wheels, premium 3D emblems and stylish flashy tail lamp add flair to the motorcycle. 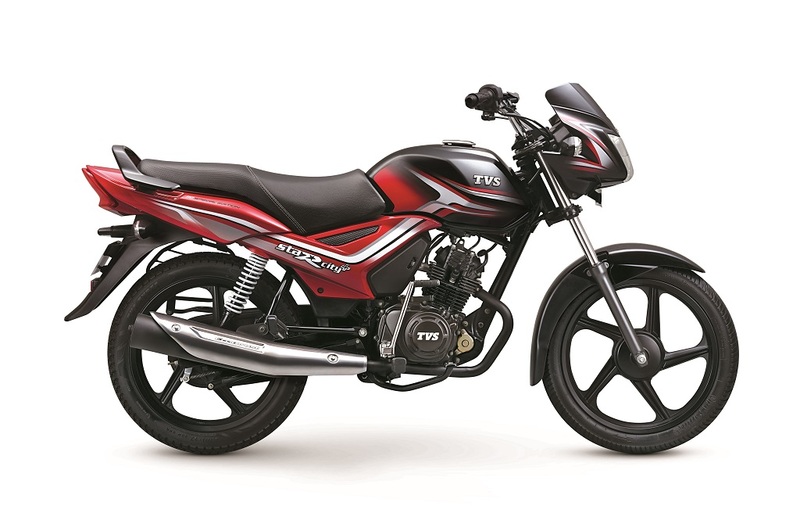 The overall chiseled and muscular design gives the TVS StaR City+ a distinct road presence. For superior ride and handling, TVS StaR City+ comes with telescopic front shock absorbers and five step adjustable rear shock absorbers to ensure a comfortable ride on almost any road surface. High grip, button type, tubeless tyres reduce the risk of skidding by providing better road-tyre contact. A padded dual tone seat made of superior material with contrast stitching makes long rides easy. Soft touch premium switch gear adds to the comfort of the motorcycle. The comprehensive digital dashboard has an analogue speedometer and an advanced digital information display. It also houses a service indicator which intimates the rider when the bike is due for service and an econometer which guides the rider to maximize fuel economy. A digital fuel gauge displays precise fuel level indication while a digital odometer conveys the exact number of kilometers covered. The new TVS StaR City+ will come in 3 colours – Black red, Black blue and Red black. The product is priced at Rs.50,534 (Ex-Showroom Delhi) for the dual tone variant and is available at all TVS showrooms. *As per TVS Motor Company Limited Internal test. However aforesaid mileage is fluctuating in nature depending on several variable factors. TVS Motor Company is a leading two and three-wheeler manufacturer, and is the flagship company of the USD 7 billion TVS Group. We believe in Championing Progress through Mobility. Rooted in our 100-year legacy of Trust, Value, Passion for Customers and Exactness, we take pride in making internationally aspirational products of the highest quality through innovative and sustainable processes. We endeavor to deliver the most superior customer experience at all our touch points across 60 countries. We are the only two-wheeler company to have received the prestigious Deming Prize. Our products lead in their respective categories in the JD Power IQS and APEAL surveys for the past three years. We have been ranked No. 1 Company in the JD Power Customer Service Satisfaction Survey for consecutive two years.